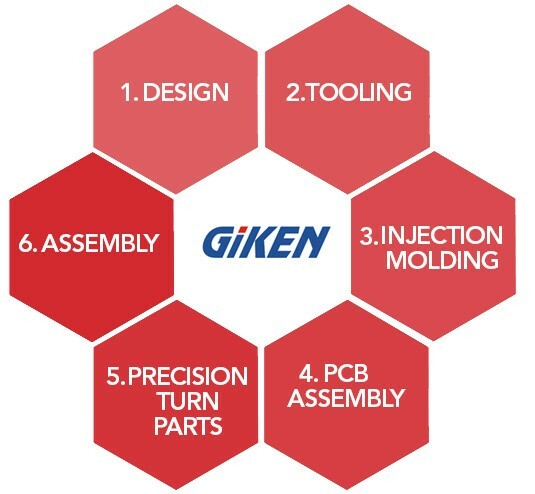 At Giken Sakata, we provide one-stop integrated solution in precision engineering. When customer has specific requirements on the production and service package, we provide customized solution according to their needs. Giken has a strong design team that cater to customers’ expectations in every aspect of the product. We also provide tooling, injection molding, and PCB Assembly services. The capability in precision turn parts and assembly complete us as an integrated service provider. Click on below tabs for more information. Own various secondary process machines such as Heat treatment , Centerless Grinding, Barrel machines and able to design Special Purpose Machine based on customer's requirment.